The literature on transverse colonic cancer resection is sparse. The optimal surgical approach for this disease is thus unknown. This study aimed to examine laparoscopic versus open surgery for transverse colonic cancer. This study was a nationwide, retrospective cohort study of all patients registered with a transverse colonic cancer in Denmark between 2010 and 2013. Data were obtained from the Danish Colorectal Cancer Group, the Danish Pathology Registry, Danish National Patient Registry, and patients’ records. Main outcome measures were surgical resection plane, lymph node yield, and long-term cancer recurrence and survival. In total, 357 patients were included. Non-mesocolic resection was more frequent with laparoscopic compared with open resection (adjusted odds ratio 2.44, 95% CI 1.29–4.60, P = 0.006). Median number of harvested lymph nodes was higher after open compared with laparoscopic resection (22 versus 19, P = 0.03). Non-mesocolic resection (adjusted hazard ratio 2.45, 95% CI 1.25–4.79, P = 0.01) and increasing tumor stage (P < 0.001) were factors associated with recurrence. Cancer recurrence was significantly associated with an increased risk of mortality (adjusted hazard ratio 4.32, 95% CI 2.75–6.79, P < 0.001). Overall mortality was, however, not associated with the surgical approach or surgical plane. 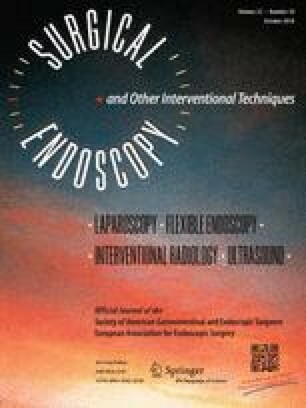 Although associated with a lower rate of mesocolic resection plane and fewer lymph nodes harvested, laparoscopic surgery for transverse colonic cancers led to similar long-term results compared with open resection. The online version of this article ( https://doi.org/10.1007/s00464-018-6159-3) contains supplementary material, which is available to authorized users. Andreas Nordholm-Carstensen, Kristian Kiim Jensen, and Peter-Martin Krarup declare that they have no conflict of interest and financial ties to disclose.